After a long, desperate fight to save their ailing dog, Jake, Dave and Cynthia Werths of Sedalia, MO, had to make the agonizing decision to have him euthanized. They were devastated – and so was their dog, Lucy. Siblings Buddy and Bella were adopted together. Cynthia’s husband, Dave, found Petfinder, and they began surfing the website, where they saw Buddy and Bella listed by Pals Animal Rescue in Wichita, KS. 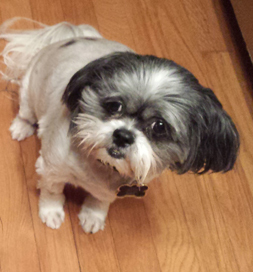 The Shih Tzus’ were siblings and had been surrendered by an elderly woman because of her husband’s health issues. The rescue wanted to place the dogs together. On the way to the shelter, they realized it was Valentine’s Day, three years to the day when Jake had first gotten sick. “I hoped it was a good sign,” Cynthia says. 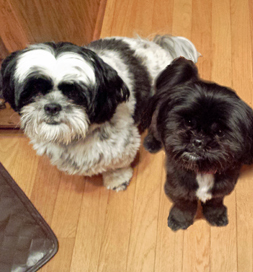 It took Lucy awhile, but now the three dogs are good friends. Cynthia has contacted the people who had to surrender the dogs to let them know they are fine, which must be a great relief to them. And Lucy’s relief is apparent as all three dogs run laps inside the house and play together. At night they curl up together to sleep. “It’s a good thing we have a king-size bed so we can all fit in it,” Cynthia says. Jake is not forgotten, but the days are full of smiles once again.